Welcome to Chattanooga's Boutique Hotel, The RiverView Inn! Built in 1935, Sky Harbor Court has played a part of America’s enduring legacy of roadside attractions and motor courts for more than 80 years. 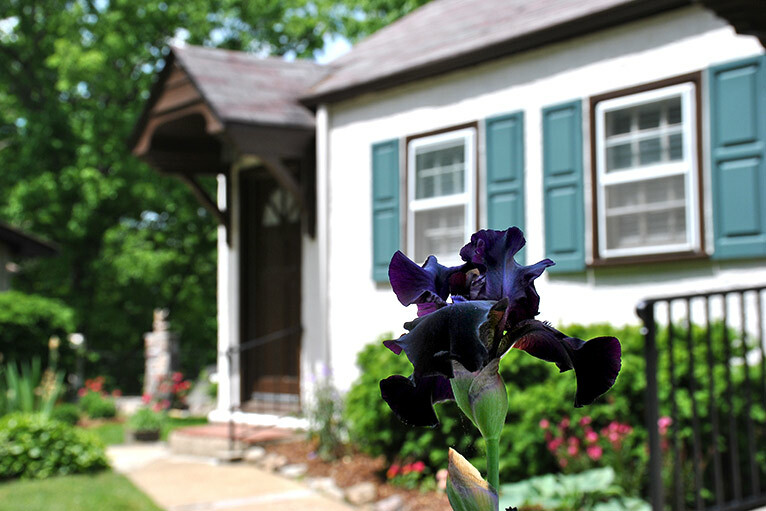 Nestled on the side of historic Lookout Mountain, the bed and breakfast is conveniently located minutes from world-famous Ruby Falls, Rock City Gardens, and the Incline Railway. We are a boutique hotel, offering an intimate, private setting with beautiful views and amenities. In 2017, we began intentional renovations to preserve the charm and history of Sky Harbor Court while refreshing guest spaces with all new bathrooms, updated furnishings, and amenities. In the spring of 2018 we completed our initial renovations and are excited to continue enhancing our guests' experiences while building Sky Harbor’s future as RiverView Inn, bed and breakfast. 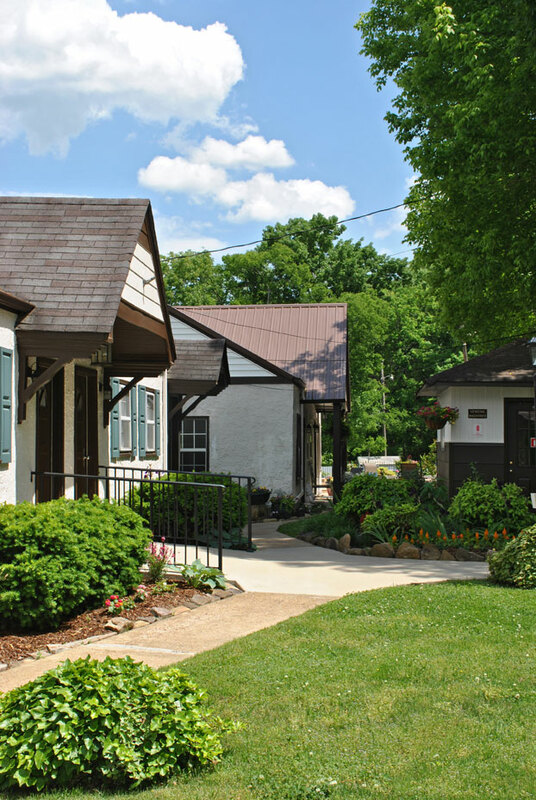 During your stay here we hope you’ll take time to relax, take in the panoramic views, unwind, connect with nature and allow the enchantment of RiverView Inn and Lookout Mountain to transport you back to a simpler time of a bygone era. RiverView Inn welcomes you to check in between the hours of 3:00 pm and 8:00 pm Eastern Standard Time. If your travel itinerary prevents you from arriving prior to 8:00 pm, when our office closes, you may make arrangements for after-hours check-in by calling our front desk prior to 8:00 pm on the day of your arrival at 423-821-8619. It is the responsibility of our guests to notify us if an after-hours check-in is needed, as we cannot guarantee a RiverView Inn Guest Experience Specialist will be on-site after office hours. Should your plans change, you may cancel your reservation without penalty up until 24 hours prior to check-in. Should you cancel within 24 hours of check-in, a cancellation fee of 50% of your reservation will be charged to the card on file. To cancel, please call us during our regular office hours of 3:00 pm- 8:00 pm est. Visit the historic Chattanooga Choo Choo and enjoy the free electric shuttle service to other downtown attractions including The Tennessee Aquarium and Riverfront areas. Lookout Mountain reaches an elevation of 2,388 feet, we are at approximately 900 ft.
A complimentary continental breakfast is served in the Skybox daily from 7:30 am until 10:00 am. Check-out is at 11:00 am, keys may be placed in the key drop, next to the office. RiverView Inn is a SMOKE-FREE property. Smoking is only permitted on the National Park Service parking lot across from the pool. A cleaning fee of $250 will be charged for smoking in the room or balcony. Enjoy our heated pool (seasonally) 8:00am - 10:00pm. Guests swim at their own risk, and RiverView Inn will not be held responsible for any injuries while using RVI facilities. Towels are available on the pool deck. Vending (ice and sodas) are available 24 hours. Extra towels and toiletry items are available at the office upon request. In the event of an emergency, please call 911. For non-emergency assistance please call or stop by the office. For after-hours assistance please call 423-650-8665. 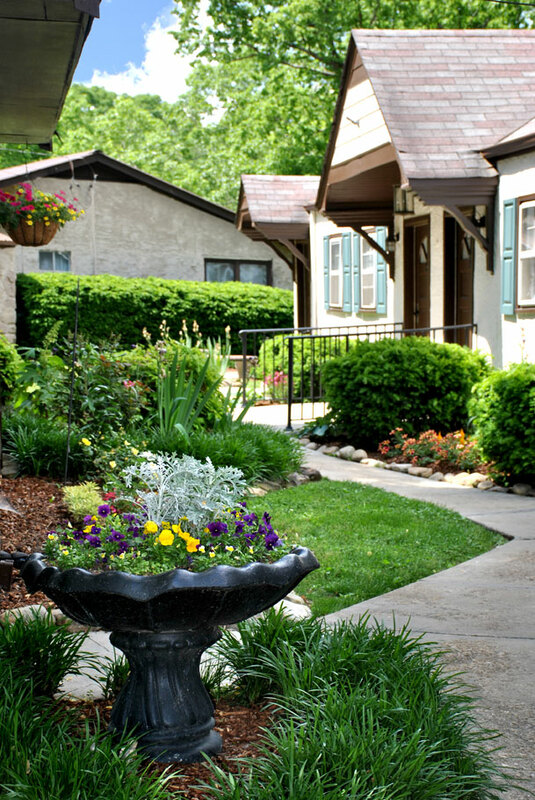 The RiverView Inn is a pet-friendly hotel in Chattanooga, TN. Dogs are permitted (limit 2) for a $25 fee per dog. Dogs must remain on a leash at all times while on the property. Dogs may not be walked on the RiverView Inn Courtyard, please use the National Park Service Greenway located across from the Inn. Dogs may not be left unattended in the room and you are responsible for damages to the room and property incurred by your pet. Excessive dog hair in the room or on the bedding may result in an additional $75 cleaning fee upon check-out. From Eastbound Interstate 24: Take exit 174. Turn right onto Cummings Hwy. (Hwy. 41). Stay on Cummings Hwy. approximately 3 miles. Watch for Lookout Mtn./Ruby Falls sign on the right pointing to a little road. Turn right here. You will immediately come to a stop sign. Turn left at stop sign onto Old Wauhatchie Pike. Go up a curvy road to the next stop sign (approx. 1 mile). At this intersection, you will see the RiverView Inn sign straight ahead. Go straight through this intersection. You will pass the Innkeeper’s Residence and then come to the RiverView Inn parking lot. The office is at the left side of the courtyard when facing the view. From Interstate 75 North and South/Westbound Interstate 24: Take exit 178 from I 24-W (ramp marked Lookout Mtn.). Go straight through the stop sign. Turn left at the traffic light onto Broad Street. At the foot of Lookout Mtn. get in the lane directing you to Ruby Falls. This will take you onto Cummings Hwy. From the railroad overpass, you will drive 7/10 of a mile to Scenic Hwy. where you will turn left. This is also the road to Ruby Falls. The next street to the left you will see the RiverView Inn sign. Turn left at the sign onto Old Wauhatchie Pike. You will pass the Innkeeper’s Residence and then come to the RiverView Inn parking lot. The office is at the left side of the courtyard when facing the view.